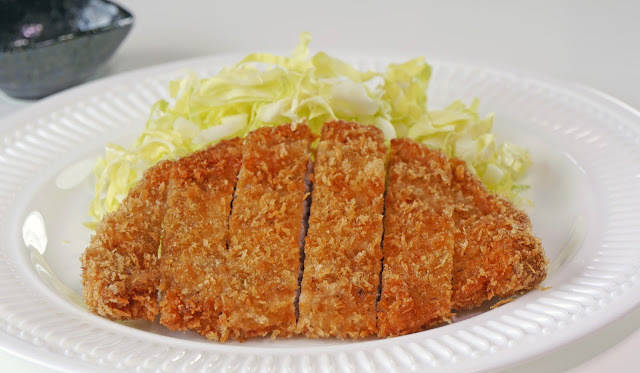 Tonkatsu is a deep-fried pork cutlet that's light and crispy on the outside and if done right, juicy and tender on the inside. In fact, this is one of those dishes that almost everyone loves, including first-time visitors to Japan. You almost always eat it with tonkatsu sauce, which can be purchased at every store across the country. If you live outside Japan, tonkatsu sauce can be found at most Asian or Japanese grocery stores. You can even get it online these days! Gotta love that technology! Shredded cabbage is always served with this dish and adding a bowl of steamed rice and miso soup makes for a very satisfying meal. First, beat the egg in a bowl. In another bowl or plate, pour panko bread crumbs in. Make shallow cuts along the edges of the pork to prevent curling. Then pound the meat using the blunt side of the knife to make it more tender. Season with salt and pepper. Coat the entire meat with flour and shake excess off. Next, dip the meat in the beaten egg. Then coat with panko making sure to coat all sides well. Gently press down to help the bread crumbs stick to the meat. Let it rest for 10 minutes. Heat oil to 340F/170C. Place meat inside. Cook until the pork floats to the top of the oil. Flip over and cook for 4-5 minutes more or until meat is fully cooked. Drain well on paper towels and serve immediately with shredded cabbage and tonkatsu sauce.